Karen Blessen: What turns compassion into action? What turns compassion into action? In my post WWII upbringing, compassionate response was extended as a hot casserole and a plate of chocolate chip cookies. It was usually delivered within the borderlines of my small town. How can the essence of that same generous gesture extend farther and more boldly? You might have been born into a family who’s programmed for public service. Or maybe a dramatic personal tragedy ignites action. But sometimes, it’s the inspiration of another person’s example that shows us how to channel emotion and outrage into useful acts. On a recent trip to Malawi and Mozambique, as a member of the HIV/AIDS advisory committee for the international relief organization Save the Children, inspiration was easy to find. We traveled into the heart of the AIDS epidemic, heard astonishing statistics, and bore witness to the horrific human toll of this disease. Every day in 2001, 6300 people died from AIDS in Sub-Saharan Africa, according to UNAIDS. 58% of the people in this area who are infected with the HIV virus are women. 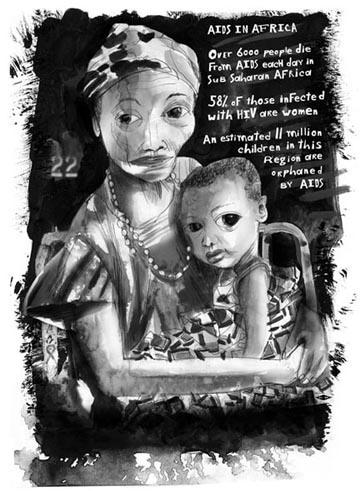 An estimated 11 million children in Africa are oprhaned by AIDS. The leader of our group was Gretchen Dykstra, Commissioner of Consumer Affairs for the City of New York and a board member of Save the Children. In a letter I received before we left, Gretchen wrote "The task now is to mobilize human resources, public and private funding, and public will to 'take to scale' proven and promising interventions." Her words showed me that, as overwhelming as the statistics might seem, there is hope, and there are solutions. With Gretchen’s guidance, we experienced both the sadness and joy of what we saw. But then, each evening, we came together, focused, and discussed solutions. She was guiding our compassion into possibilities for action, in a way that was energizing and powerful, without a hint of guilt driven duty. In the small village of Kafucheche, Malawi, women from the Village Aids Committee performed for us. Dancing, shoulder touching shoulder, they sang about how they take care of HIV/AIDS patients in their village. Their dance and song demonstrated a beautiful, "stand up" defiance to the tide that they face. In Mangochi, Malawi, we visited the district hospital, where we saw 500 patients being treated in a 240 bed hospital. AIDS patients sat on numbered beds or laid silently on straw mats on the floor. Emotions in our group flowed freely. I left saying, "No, it doesn’t have to be this way. It shouldn’t be like this." In a story that ran in the June 23 issue of Texas Living, I described Mangochi Hospital, and wrote about, and did portraits of, five women I met in Malawi and Mozambique. Three of the women are living with HIV. The other two, a teacher and a village elder - both healthy - are dealing with the ramifications of AIDS in their villages. Dozens of Dallas Morning News readers responded. Lisa Castillo, a massage therapist at Cooper Fitness Center empathized. She wrote "I think about my 3 1/2 year old little girl. What if we lived in Africa and she was going through this -- not knowing if her Mom and Dad would be around.......it’s too much!" Jim Barber, Coordinator of Student Programs and Fraternity Activities at SMU told me about student activism at SMU, where each year fraternities raise thousands of dollars for pediatric AIDS. Pastor Diana Holbert offered to involve her church group in Adopt A Village, the program developed by our HIV/AIDS advisory committee. Albert H. Halff, who describes himself as "more of a long range solution person" wrote and asked how he could help in "providing better living conditions, such as water supply, waste water treatment, paved roads, and irrigation." Bailey Tyler, a pharmacist from Tyler, expressed interest in sponsoring one of the HIV positive women described in my article. What is the cost, then, if we don’t act? There’s the clear humanitarian toll. UNAIDS projects 44 million AIDS orphans worldwide by 2010. U.S. Secretary of State Colin Powell calls the AIDS pandemic a national security issue. But what about the personal cost? The realization of the magnitude of suffering can arrive like a blow. If we stay overwhelmed and paralyzed, we’re numbed, powerless. We become yet another victim. There are things that we can do. Well managed international relief organizations, such as Save the Children, CARE, Doctors Without Borders, the International Red Cross, and Dallas’ own Uganda Children’s Charity Foundation, have infrastructures in place, and everyday heroes in the field. They need our financial support. You can specify that you’d like your contribution to go to Africa. The U. S. has only committed $500 million to prevention of mother to child transmission of AIDS. This doesn’t help the mothers and fathers living with a death sentence, or the children who need to be educated about HIV prevention. Some experts estimate that our share of international aid for global HIV prevention and treatment should be closer to $3 billiion dollars. Congress is now considering legislation to increase our HIV spending to $5 billion, over two years. We can write or call our representatives in Washington D.C. and ask them to act boldly, generously, and as visionaries. We can start dialogues at our churches, synagogues, and mosques. We can ask, "Where are we, and what can we do, in the face of this generation spanning plague? Can we erase the borders that separate us? How big is our family?" Shoulder touching shoulder, with our voices, our money, our pens, our persistence, our knowledge, and our medicines, we can join forces with the brave people of Africa who are fighting HIV/AIDS. We can "take this to scale" and we can turn a tide. Karen Blessen is a Dallas artist and writer. Contact her at kblessen@aol.com.